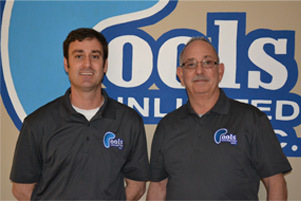 Pools Unlimited Inc. has been serving the MidSouth since 1976 as a family owned and operated business. Pools Unlimited Inc. specializes in custom built gunite swimming pool and spa construction along with providing weekly pool maintenance and services. Pools Unlimited Inc. additional services include a variety of custom water features, fountains and renovations from replaster to a complete remodel. Pools Unlimited Inc. mission statement is to provide “More than a Pool but an Investment in Quality”. Pools Unlimited Inc. is a member of the Association of Pool and Spa Professionals (APSP) and currently serving on the board of directors. Pools Unlimited Inc. is also a member of The Memphis Area Home Builders Association the Better Business Bureau holding an A+ rating. Pools Unlimited Inc. has received many merit and recognition awards over the years. Pools Unlimited Inc. is a licensed general contractor with the State of Tennessee. Pools Unlimited Inc. strives for excellence and quality in all areas of the pool industry. Our ultimate goal is to achieve complete satisfaction from all of our customers. We pride ourselves on Honesty, Integrity, Quality and Service. These characteristics are upheld not only to the customer but to our distributors, manufactures and others we come in contact with.